Increasing dependence on food imports, declining agriculture and vulnerability to natural disasters are creating a health crisis of obesity and malnutrition in Jamaica. 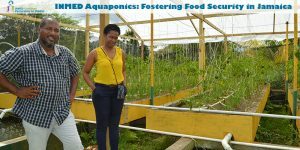 INMED’s Adaptive Agriculture program is using aquaponics to foster economic development, sustainable access to fresh produce and income opportunities for youth. Learn more at http://inmed.org/what-we-do/changeadaptive-agriculture-and-aquaponics/.